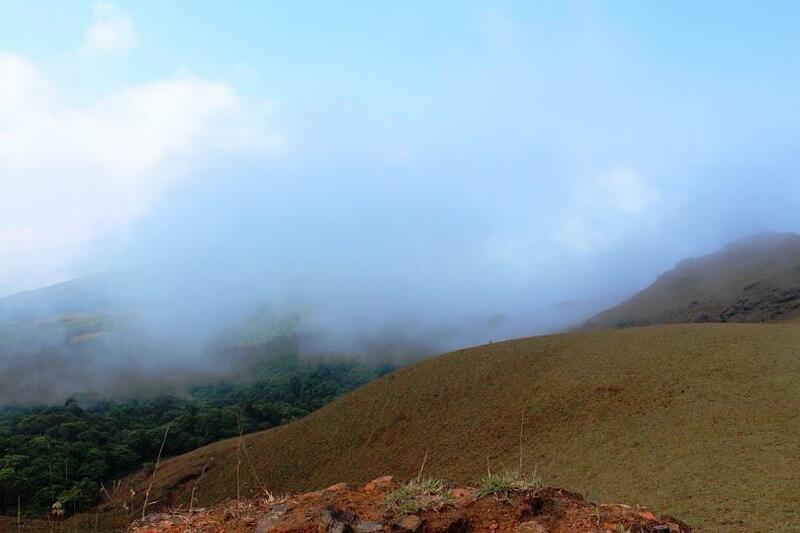 Western Ghats has unique identification and hided many more natural beauties in it, which a common man can’t reach the place. Bandaje Arbi Falls is, one of those place list, which flow 365 days in a year. This Falls is located in Charmudi Ghat of Dakshina Kannada district. 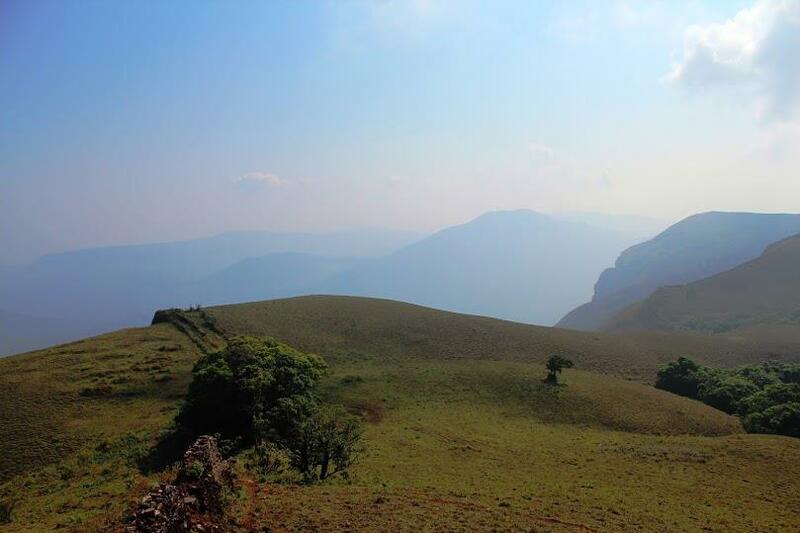 The trek base point is Mundajje, which is around 12 km away from Ujire (close to Dharmasthala). One need to have a strong determination and strength to reach this falls and enjoy the Mother Nature glory. Since introduction to Bangalore Ascenders (BASC), I have made a list of, must visit places in and around Karnataka. Bandaje Arbi Falls & Ballalarayana Durga is one in the top most list. When I seen the event registration mail by Niranjan (Event Organiser), called to my friend Sudhakar & Chandrakanth (CK), asked them to register soon. Due to time constrain CK could not make it to join with us. We were not sure about getting short listed to this event, as the team size mentioned 12 members. Luckily, we both are happy to see our name in short listed. We were eagerly waiting 15th March, 2013 to leave to Bandaje. As BASC common boarding point is Shanthala Silk House, I was present much ahead stipulated time 9.30 pm. Already couple of friends (co-trekkers) were present at the place and soon everyone joined. I got a warm welcome by Ram, Umesh and later Niranjan. We left the Bangalore around 10.30pm in Tempo Traveler (TT). We had a brief introduction along with sharing our previous trekking experience in the TT. The team members are Ram, Umesh, Venu, Govind, Sreeharsha, Sudhakar, Harsh, Diptankar, Ashutosh, Satish, Niranjan & myself. 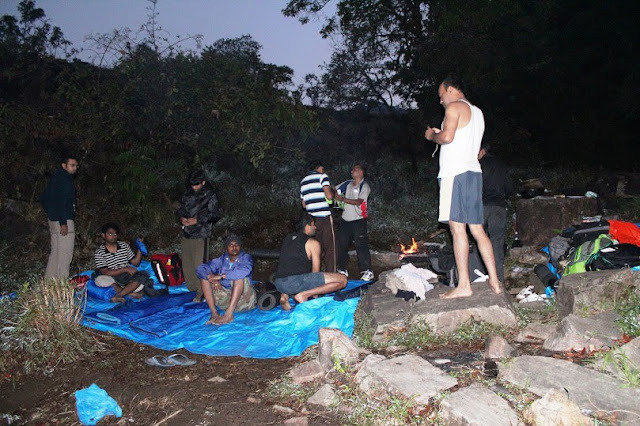 I met Govind & Sreeharsha in the previous event of Dabbe Falls & Kanoor Kote; I got nine new friends in this event. Introduction part went on till 12 midnight and later everyone slipped into deep sleep. 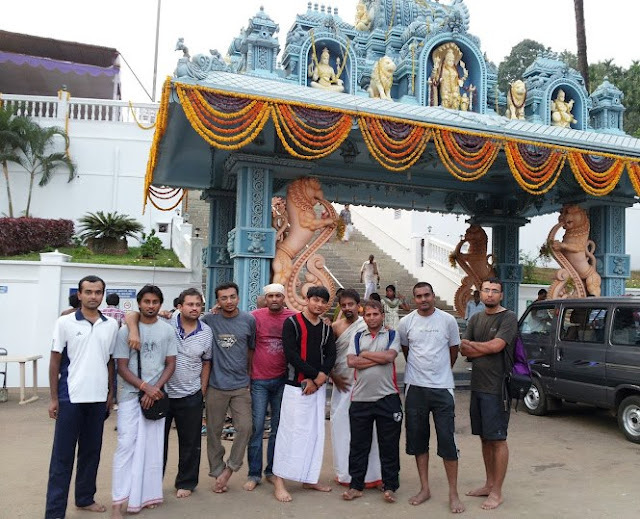 The seats were not so comfortable and I was struggling to get a sleep…..
We reached Ujire (via Dharmasthala) around 4.30 am. We finished our morning itinerary at public toilet and had delicious breakfast Upama & Idli. 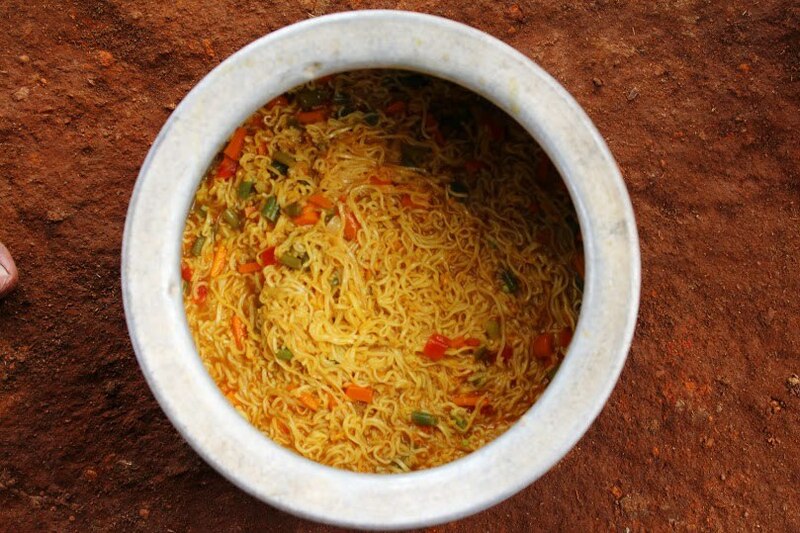 Packed Chitranna for lunch to have during the trek. Niranjan explained the details about our two days trek. Bandaje falls is around 16 km from trek initial point. We should appreciate his leadership capabilities and tactics during this trek. We all got ready to leave towards Bandaje Falls. Started our trek to view the majesty of the Bandaje Falls. We have crossed the last house of ‘Babu Nayak’ and took right trail to proceed towards the Bandaje falls. The real trek started now and understood that, the whole trail is steep ascend almost 15 km. The forest is completely thick and humidity is more. We trekked around 2km and took first break. Govind was busy in photography and shouted ‘anyone wants to see Snake’? Myself, Sudhakar, Ram rushed to the place. A green baby snake was lying on th tree; he caught it and asked us to hold it. Not only human being, even any other also get reacted immediately whenever they feel insecure. Snake was got position to attack; finally it bites to Govind finger. We were scared, but he realized us; it’s a non-viper and nothing to worry. Being its thick forest and no trail; very difficult to find out the path and reach the destination in-time. The way was not so easy, everyone sweating badly. Due to high humidity and steep ascend, the pace of journey was very slow. We found elephant dungs entire the trek. After multiple breaks and two hours continuous trek reached the water stream around 10.30 am. Everyone decided to dip into water and get relaxed for some time. Water was very cold!!! We had enjoyed the stream almost one hour and had the snacks. The steep ascend is continued again, taking number of breaks at last we reached the grassland. 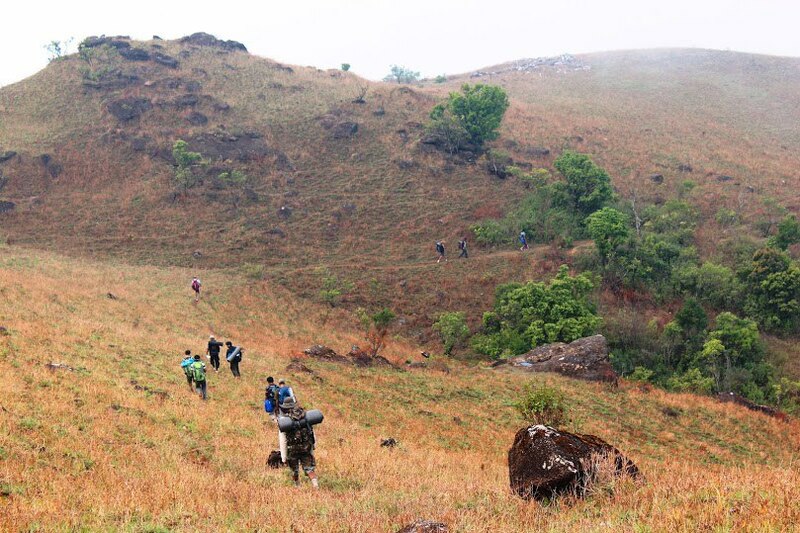 Bandaje 70% of path is covered by thick forest and rest is open grassland. The time was 12.45 pm, everyone decided to have the lunch at the entrance of grassland. We took a long break with lunch and photography session. Now the real challenge begins. We could able to view the beautiful falls from grassland and we may feel to reach within a short time. But we can’t!! The sun was not mercy on us and there was no wind. 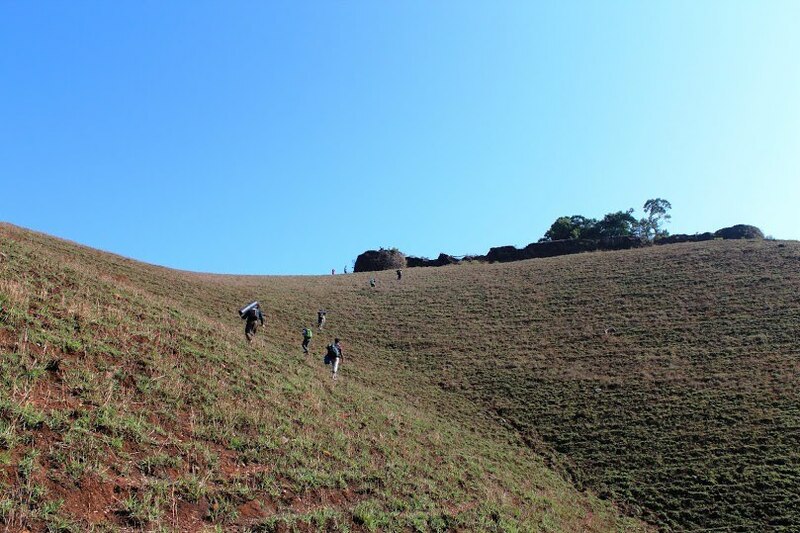 Grass land path also very difficult to ascend and taking breaks at last we reached the glorious Bandaje Arbi Falls at 3.30pm. Everyone will forget the tiredness by seeing this falls. It’s amazing and so wonderful. The stream flows down almost 400 meters and anybody should have courage to view the depth of this falls. We should be very careful here. 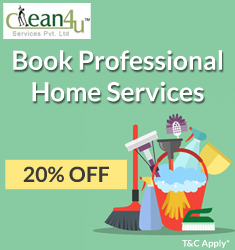 There are many instances happened where people have lost their valuable life. There is no boundary or fencing and moreover the rock is very slippery. Whoever visits this place, be careful and don’t try to play any nonsense things here. Friends were busy in taking the photographs, solo and group in different styles. We said good bye to Guide (Sanjay) paying 600 bucks. We had enough of time to spend at falls. We decided the night camp near the stream. The schedule of the evening is, preparation of Maggie, relax for 1 hour, have the soup around 7 pm, dinner at 9 pm and camp fire entertainment till 10 pm. Umesh, Sudhakar, Ram were busy for collecting the wood for night camp fire. Few of us took bath again in the stream. Oh my god, water was very cold. After the break, the Maggie preparation started. Umesh is always ahead in all activities, he could able spark the fire. The real part of adventure and scary now!!! The rain started rudeness with sound of thunder and lightning. Goodness, we had 3 tarpaulins, using 2 we covered our luggage and rest we used it for our shelter. Rain poured almost one hour and it’s shattered our all plannings. There was no shelter except open sky. The whole ground was wet and not so easy to pass the rest of the time. We all had yummy Maggie and decided the next strategy. The clouds were still panic, decided to protect our luggage and if rain continues need to night vigil. Nature was not enough rude on us, at last we could able to see the stars. Friends were not in mood to have the dinner and everyone to slip in sleep as early as possible. We brought the rice and puliyogare paste for dinner. Decided to prepare the rice and have hot puliyogare. We had tasty and hot dinner around 8.30pm. Initially we decided to sleep in three groups, seeing the ground wet and availability of tarpaulins, we all gathered in one and went off sleep. I and Ram had song jugalbandi till late night. We need to take cares the camp fire to protect from wild animals. Our great Umesh took the initiatives. I could not able to sleep well in the night. It was my first experience to sleep in such a place which I could not think at all. Thanks to the rain making our trek more adventurous. I would like to appreciate Ram capabilities during the trek. He was one who not had regular food, less sleep and always ahead in the group. By curiosity I asked the secret, understood he is a Yoga patu and practice 2 hours every day. I woke up around 4.15 am, by the time Ram also got up. We struggle to light the fire where Umesh again helped us. 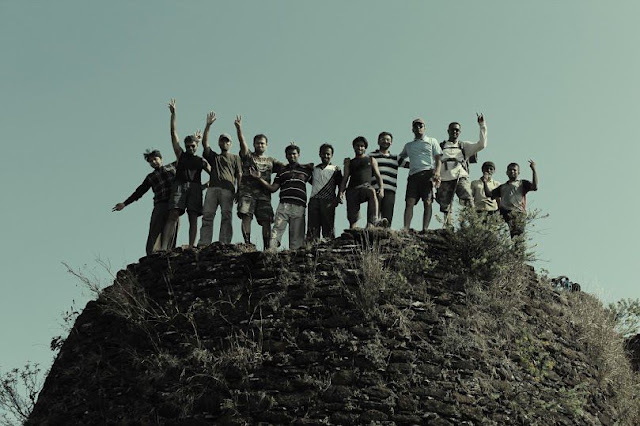 Everyone got up by 6 am and finished our morning nature call and headed towards our second destination to conquer the Ballalarayna Durga. The distance of the fort is almost 6-7km from falls and minimum 2 hours journey. As per plan, we need to reach the fort before sun bitter on us. Our journey started around 7 am and the path as before. Nothing was change in the ascend except few steps flat surface. We could able to enjoy the beautiful view the entire valley. In between we had photography session, breaks and sharing the experiences. After few kilometer treks, we could able to view the fort, but we need to walk almost more than an hour. The last part of the portion is very difficult and examines our strength. We conquered the fort around 10 am. Except the shattered walls nothing much at Ballalarayana Durga, however you can enjoy the Mother Nature and beautiful of valley. We met the fort king (forgot his name) who runs the cattle-shed in the fort. He has around 50 cattle and welcomes to all visitors of the fort. We decided to prepare once again breakfast. King offered us his kitchen for preparation and provided the water. Everyone was hungry and had delicious Maggie. 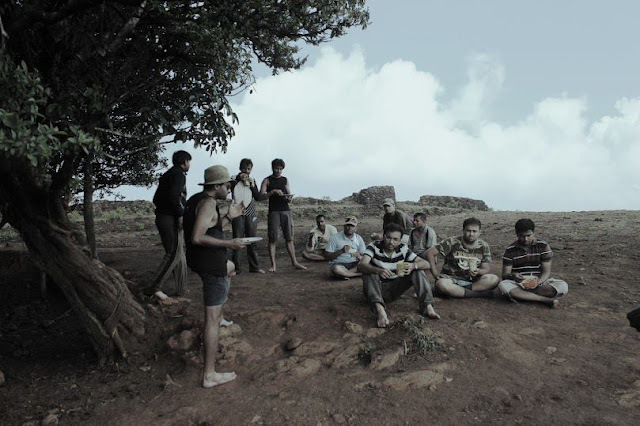 We had good time at fort and relaxed an hour before proceeding towards Sunkasale. Understood from the King, the Sunkasale (our ending point of trek) is around 6 km and one hour journey. We decided take one more hour long break and did accordingly. We left the fort around 11.30 am. All are happy spending almost two hours at fort. From fort onward 6 km trail is descending one. The pace was fast, again entered into forest trail before reaching the jeep track. Taking very less break, reached the Sunkasale at 2 pm. Meantime Niranjan called the driver and asked to come Sunkasale. Within an hour TT reached our place and we all boarded towards Horanadu. From Sunkasale, Horanadu is around 30 km. Reached the Horanadu by 3.30 pm and decided to dip in Bhadra river. Everyone had holy bath in the river and Niranjan asked us to finish the feedback part while taking a bath. We finished vote of thanks and feedback and headed towards Horanadu town. Took Darshana of Annapoorneshwari and had Prasad (dinner). We left around 10.30 pm to Bangalore. We trekked around 25-27 km in two days, however still my desires and passions not fulfilled. I was thinking during jounrey "what will be the next event in BASC?" Thanks to each one of friends (co-trekkers) who were so co-operative, friendly and also who have taken photographs as and when requested. 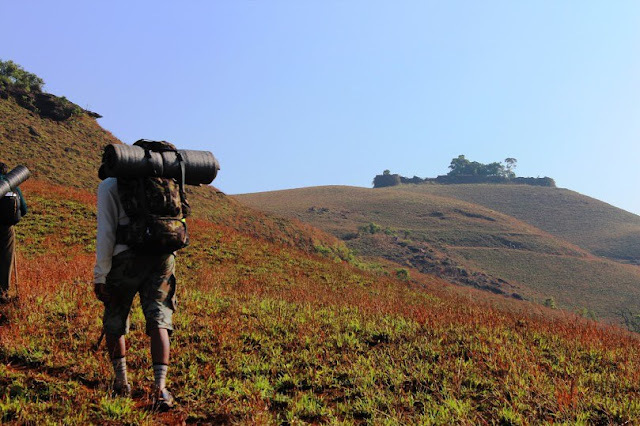 Special thanks to Niranjan giving an opportunity to be part of this wonderful trek. No words to BASC, motivating and giving opportunity to enjoy the real beauty of Mother Nature. Last but not least, my close friend ‘Sudhakar’ who was co-trekker with me and giving wonderful company. Umesh great guy, never seen him idle. Always he is first in all activities.